In addition to the pomegranate, pears and blueberries were also included. Any berry or fruit you have on had would work nicely. 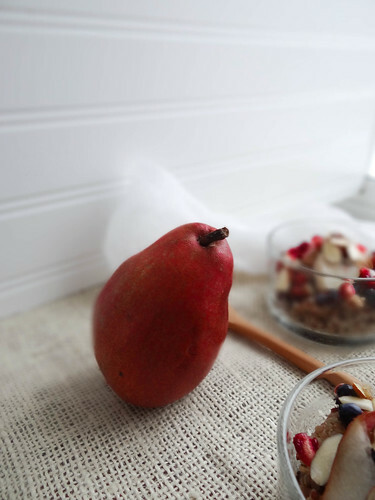 I just happen to love pears this time of year and the blueberries were picked last summer and frozen to enjoy throughout the winter months when you simply need a burst of berry brightness. Tri colored quinoa is simmered in almond milk with cinnamon & vanilla. It wasn't until I was in my early twenties that breakfast became part of my daily routine - yes, that is correct I was a breakfast skipper in my teens. Now breakfast is something I look forward too, crave and get excited about. For the finishing touch, pure NH maple syrup is drizzled over the berries then topped with a few almonds slivers. The quinoa keeps well, you could easily double or triple the recipe for a quick weekday breakfast, sadly mine did not last long enough, it was too tempting not to eat later in the day as a snack. For me, January is all about fresh starts and healthy new beginnings - I try my best throughout the year to eat healthy whole foods based meals, once in a while ahem, the Holidays I can get a bit off track. Schedules, sweet treats and decadent meals seemed overly abundant this year - I look forward to finding that balance and keeping on track for the remainder of the year. Sweet treats and decadent meals will certainly have their place at my table during the upcoming year along with healthy, wholesome meals too. How do you find your balance after the Holidays? Do you look forward to breakfast, were you ever a skipper? in a medium sauce pan bring almond milk, cinnamon & vanilla to a boil, add rinsed quinoa, cover and simmer for 10 minutes. Turn off heat and allow quinoa to rest for an additional 10 minutes. 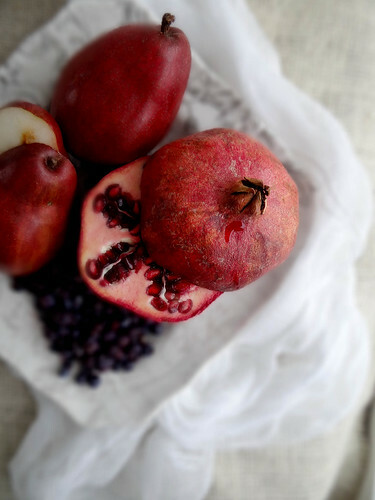 Fill a large mixing bowl with water, carefully cut your pomegranate in half. Working with one half at a time, immerse the half in the bowl of water (under water) carefully pull away at the otter skin and remove the seeds from the pith. The seeds should fall to the bottom and the pith will float to the top. Repeat with remaining half until all seeds are released from both halves. Drain water from the bowl and store seeds in an airtight container. Wash and cube 1 red pear, rinse blueberries or thaw frozen blueberries by running the berries over quickly with warm water. 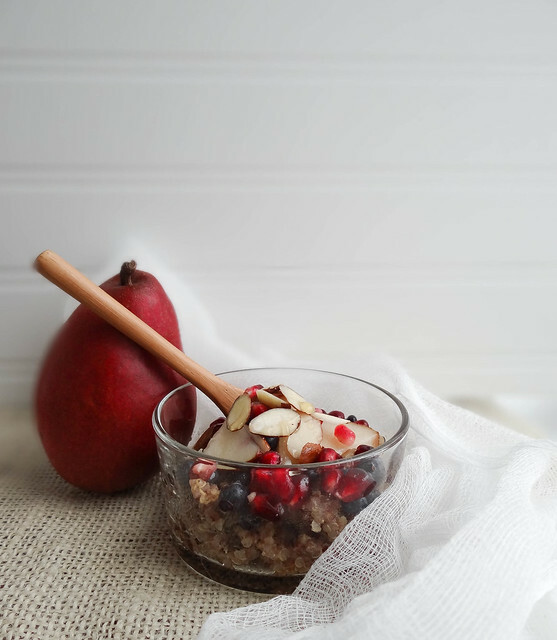 Layer quinoa in a small bowl with pomegranate seeds, blueberries & pear. Drizzle with maple syrup and sprinkle with almonds. 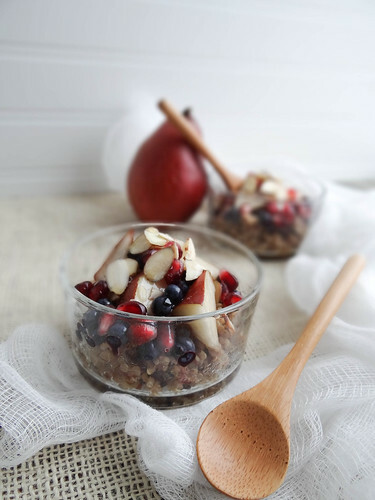 *if making for the week, store quinoa separately from the fruit - pomegranate seeds and blueberries will keep well after prepped, however wait to cut up your pear just prior to serving. i was a breakfast skipper until college. 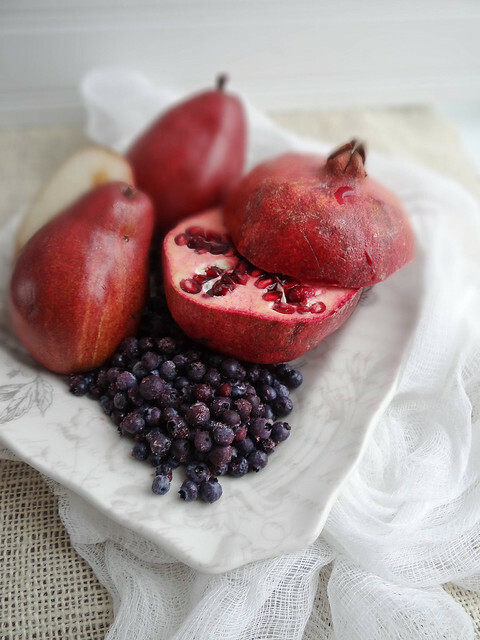 i love the beautiful pomegranates, pears, and blueberries in this breakfast. it's beautiful! I love quinoa. 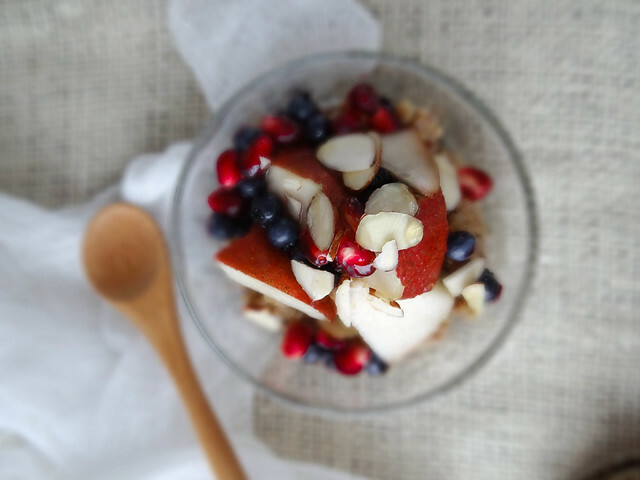 I use to make it into a chai spiced pudding for a really low sugar, but satisfying dessert. any tips on how you take your photos :) they are as delicious as your food! I keep hearing about breakfast quinoa, but have yet to try it. But this combination with beautiful fruit may have me convinced! 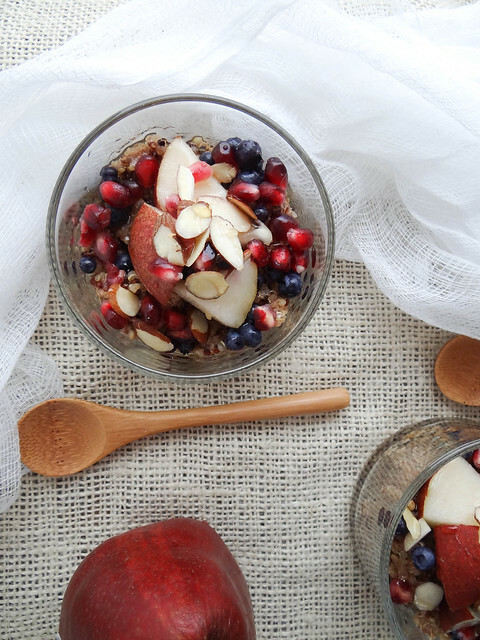 Who doesn't want an excuse to eat pomegranates for breakfast, anyway? I love this idea ... and the pictures, too!!!!!!!!! Hm, sounds lovely. I've never thought of having quinoa for breakfast but I guess it's as good as oats (maybe better? We'll see, I'll try it out). That's really healthy! I could eat it for a dessert as well! 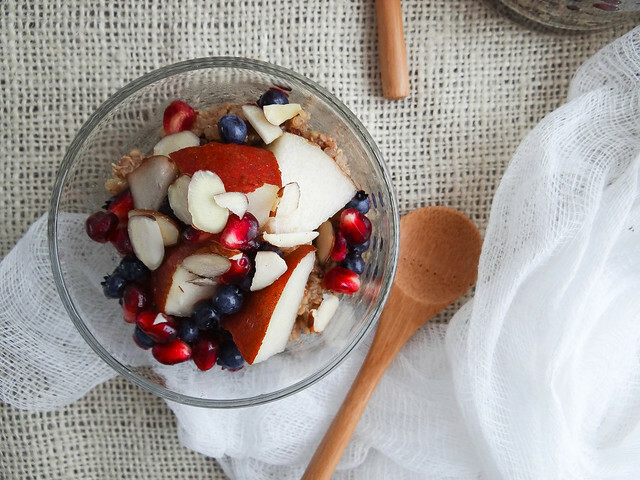 that quinoa breakfast bowl looks so delicious. As a teen I used to skip breakfast too, but now I always have a big delicious smoothie in the morning. I might have this beautiful bowl today! looks so yummy ! 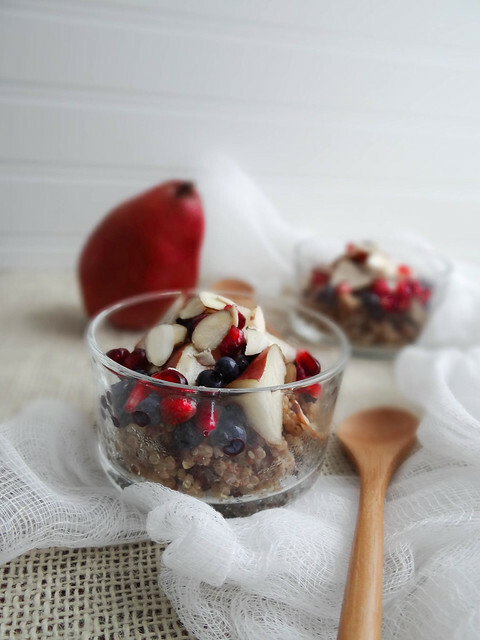 I need to try more variations of breakfast quinoa, especially since I can make a batch and then have breakfast already made for a few days in a row! I love how you used tri-colour quinoa - combined with those dark fruits it makes for a dramatic looking effect! Just looking at these pictures makes me feel healthier! 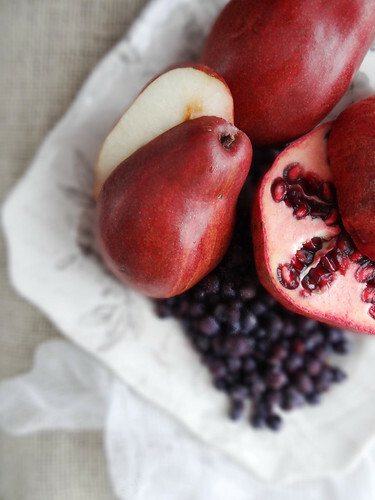 Pomegranates and red pears are so gorgeous, and these are great photos. 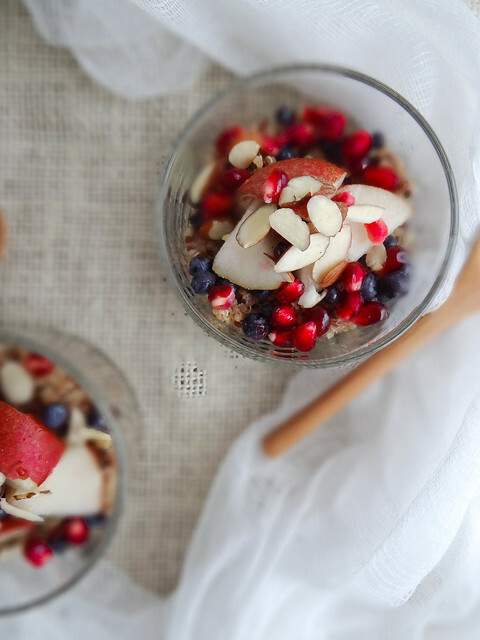 Thanks for reminding me that quinoa can be for breakfast; I've been wanting to incorporate this grain into my family's diet more, and here's a great way to do it. This looks like a wonderful way to start the day! I keep meaning try quinoa for breakfast, but I just haven't gotten around to it. I used to be a breakfast skipper, in my teens, but now, it's sometimes my most favorite meal of the day! I love quinoa for breakfast! 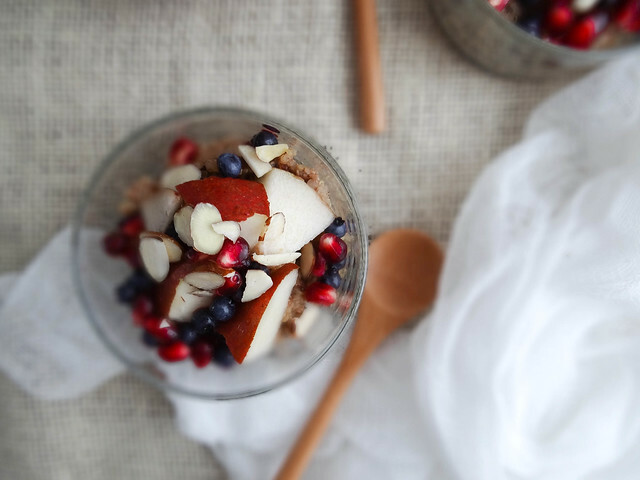 Not too different from oatmeal, but different enough that it feels a bit decadent and is really healthy! Beautiful images! Quinoa for breakfast makes an appearance around here every now and again too. Always a nice change from the usual oatmeal. Stunning photos as well! I could just eat them up. 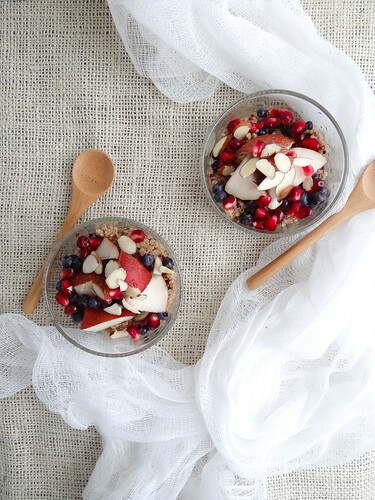 Quinoa for breakfast : that's an idea ! 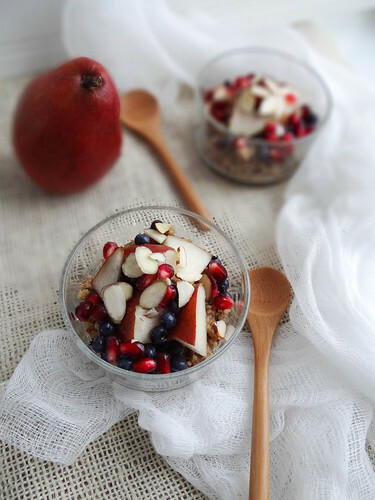 Oooh, beautiful pomegranate and berries! I've always loved breakfast... most days, it's the reason I bother getting out of bed in the morning! And I'm with you - definitely looking forward to getting back on track this year (but having a little more trouble than usual with all the cake baking I've been doing... yeesh!). 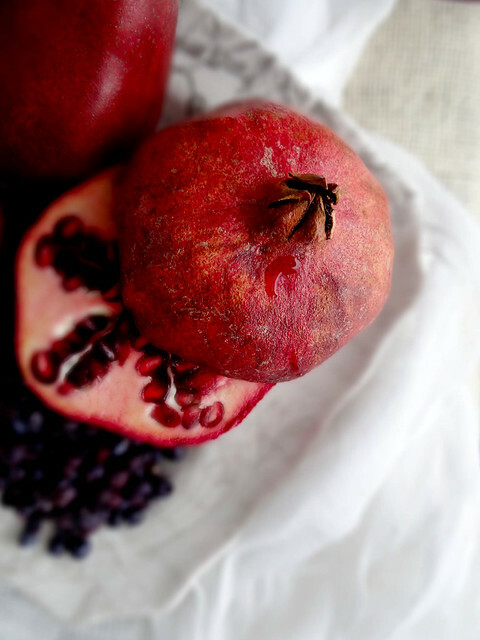 Most importent pomegranate healthy benefits are it can lowers the risk of blockage in the arteries which can cause a restriction in the flow of blood to the heart and brain.